Why Forests? Why Now? (CGD, forthcoming) draws upon science, economics, and politics to show that tropical forests are essential for climate stability and sustainable development, that now is the time for action, and that payment-for-performance finance is a course of action with great potential for success. The articles below, based on peer-reviewed papers of the Why Forests? Why Now? Book and Paper Series, will inform the chapters of the forthcoming book. This research is ongoing, and more articles will be posted as they become available. The authors acknowledge with gratitude the contributions of CGD colleagues Jens Engelmann, Kalifi Ferretti-Gallon, Sara del Fierro, Aaron King, and John Osterman. The Center for Global Development is grateful for contributions from the Norwegian Agency for Development Cooperation in support of this work. Climate change is a fundamental threat to global prosperity. In particular, climate instability looms increasingly large as an obstacle to achieving development goals. Millions of the world’s poorest people perch on hillsides prone to landslides, farm arid lands susceptible to drought, or live in coastal cities vulnerable to storms and rising seas. Low-income households and countries lack the assets that cushion citizens in rich countries from natural disasters, rendering them vulnerable to shocks. Take Honduras, for example: before Hurricane Mitch in 1998, Honduras was steadily reducing poverty. The storm caused an estimated $3.8 billion in economic losses and dealt a severe setback to economic growth and poverty reduction efforts. Extreme storms such as Hurricane Mitch routinely drag down economic growth for decades, and they are likely to become more frequent and more severe as Earth warms. The impacts of Hurricane Mitch in Honduras were magnified by previous deforestation of upland slopes, which removed barriers to runoff and erosion, exacerbating downstream flooding and destruction of infrastructure when the heavy rains hit. The role of tropical forests in buffering the impacts of tropical storms is just one of the many ways that they make significant—and often invisible—contributions to developing economies. Beyond their role in enhancing resilience to climate change and preserving options for adaptation, tropical forests are the source of goods and services that support rural livelihoods, health and safety, and food and energy security. Continued deforestation in Honduras and elsewhere will not only worsen the impacts of future storms, it will also contribute to the likelihood of their occurrence: tropical deforestation is a major source of the emissions that cause climate change. If tropical deforestation were its own country, it would be the world’s largest emitter, ahead of the United States and on par with China. Reducing emissions from deforestation and forest degradation is therefore an essential element of any climate change mitigation strategy. In meeting the global challenges of our time—climate and development—tropical forests are an undervalued asset. In meeting the greatest global challenges of our time—averting catastrophic climate change and achieving development goals—tropical forests are an undervalued asset. Indeed, despite their importance to climate change and development, tropical forest ecosystems continue to be destroyed at a high and even increasing rate in most forest-rich countries. The largest single cause of forest loss is commercial-scale agricultural expansion—often illegal—to supply the appetites of consumers in rich countries and emerging economies for globally traded commodities such as pulp and paper, palm oil, soy, and beef. Public subsidies for biofuels add fuel to the fire by increasing demand for feedstocks that replace forests. The good news is that the science, the economics, and the politics are aligned to support a major international effort in the near term to reverse tropical deforestation. 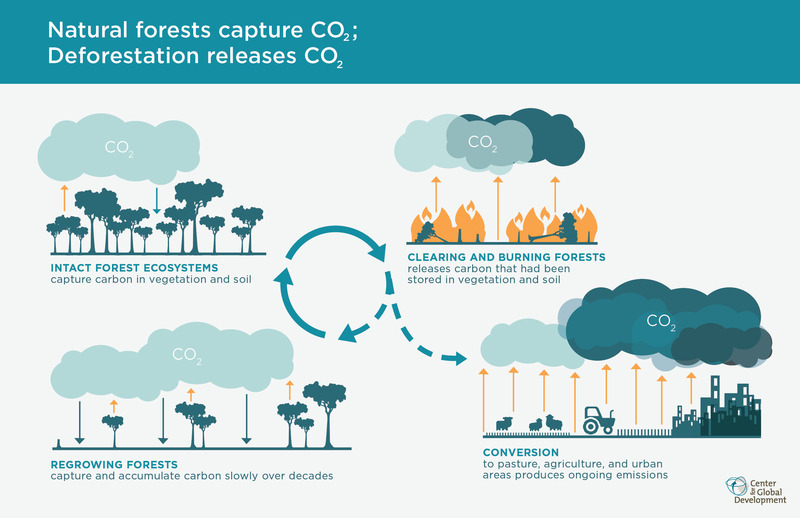 The Science: Growing tropical forests are already removing a large portion of current emissions from the atmosphere, serving as a natural carbon capture and storage technology. Forests affect the climate at continental scales by bringing rainfall to inland farmers. Advances in remote sensing technology make it possible to track and respond to deforestation events in near real time and to measure forest-based emissions annually with a high degree of accuracy. The Economics: Fresh analysis confirms that including forest conservation in climate mitigation strategies is a “best bet” for achieving more, cheaper, and faster global emission reductions. The national and local economic benefits provided by tropical forests are substantially undervalued in development decision-making. Following decades of research on what causes deforestation, and what policies can stop it,Brazil has proven that it is possible to reduce deforestation while increasing agricultural production. The Politics: Through the United Nations Framework Convention on Climate Change, the global community has agreed on a framework to reward forest countries for reducing deforestation, and leaders in those countries are ready to act. Actions to address the drivers of tropical deforestation can be aligned with domestic constituencies for reform in forest countries, including those interested in clarifying the rights of indigenous peoples, those working to increase transparency and reduce corruption in decision-making related to natural resources, and those whose livelihoods depend on the goods and services provided by forests. In rich countries, providing performance-based finance directly to national and local governments in forest countries and removing perverse subsidies for commodities that drive deforestation appeal to a wide range of constituencies. Large-scale finance for forests generated by a global agreement on climate change will not likely be available until 2020 at the earliest. In the absence of concerted action in the meantime, the clearing and burning of forests will continue, and there is a risk that political momentum will dissipate. The window for action is closing. Payment-for-performance approaches to reward forest countries for protecting their remaining forests show promise. Significant additional finance is needed now to capture ecological and political opportunities before they are lost, and would complement the current wave of “demand-side” measures to eliminate tropical deforestation from commodity supply chains. The funding available now for reducing deforestation to meet climate and development objectives is too small, too slow, too dependent on the public sector, and not sufficiently performance-based to realize the full potential of forests to limit climate change. More large-scale trials of performance-based finance would generate more robust lessons regarding how this new model of international cooperation can work. Global development is not possible without a stable climate, and a stable climate is not possible without forest conservation (see figure 1). Payment-for-performance finance to national or local government jurisdictions can help forest-rich countries achieve forest conservation. 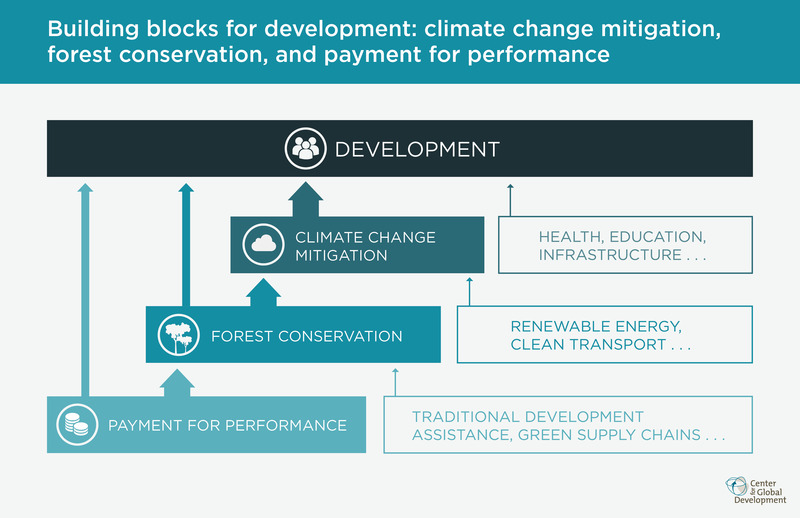 Like climate stability, both forest conservation and the payment-for-performance finance model contribute directly to development. Why Forests? Why Now? makes the case to development policymakers and climate financiers in rich countries that reversing tropical deforestation is urgent, affordable, and feasible.
. K. Brandon, “Ecosystem Services from Tropical Forests: Review of Current Science,” CGD Working Paper 380, Center for Global Development, Washington DC, 2014.
. S.M. Hsiang and A.S. Jina, “Effect of Environmental Catastrophe on Long-Run Economic Growth: Evidence from 6,700 Cyclones,” NBER Working Paper 20352, National Bureau of Economic Research, Washington DC, 2014.
. S. Dasgupta, B. Laplante, and D. Wheeler, “The Economics of Adaptation to Extreme Weather Events in Developing Countries,” CGD Working Paper 199, Center for Global Development, Washington DC, 2010.
. Ibid. ; K. Mullan,“The Value of Forest Ecosystem Services to Developing Economies,” CGD Working Paper 379, Center for Global Development, Washington DC.
. R. Goodman and M. Herold, “Why Maintaining Tropical Forests Is Essential and Urgent for a Stable Climate,” CGD Working Paper, Center for Global Development, Washington DC, forthcoming.
. N. Stern, The Economics of Climate Change: The Stern Review (Cambridge: Cambridge Univ. Press, 2007).
. M. Hansen et al., “High-Resolution Global Maps of 21st-Century Forest Cover Change,” Science 342(6160): 850–3.
. S. Lawson et al., Consumer Goods and Deforestation: An Analysis of the Extent and Nature of Illegality in Forest Conversion for Agriculture and Timber Plantations, Forest Trends Report Series (Washington: Forest Trends, 2014).
. U.M. Persson et al., “Trading Forests: Quantifying the Contribution of Global Commodity Markets to Emissions from Tropical Deforestation,” CGD Working Paper, Center for Global Development, Washington DC, forthcoming.
. K.A. Elliott, “Biofuel Policies: Fuel versus Food, Forests, and Climate Change,” CGD Working Paper, Center for Global Development, Washington DC, forthcoming.
. S. Goetz et al., “Measurement and Monitoring for REDD+: Needs, Current Technological Capabilities and Future Potential,” CGD Working Paper, Center for Global Development, Washington DC, forthcoming.
. J. Busch and J. Engelmann, “The Future of Forests: The Potential Contribution of Reducing Tropical Deforestation to Climate Change Mitigation,” CGD Working Paper, Center for Global Development, Washington DC, forthcoming.
. K. Ferretti-Gallon and J. Busch, “What Drives Deforestation and What Stops It? A Meta-Analysis of Spatially Explicit Econometric Studies,” CGD Working Paper 361, Center for Global Development, Washington DC, 2014.
. D. Nepstad et al., “Slowing Amazon Deforestation through Public Policy and Interventions in Beef and Soy Supply Chains,” Science 344(6188): 1118–23.
. A.G.M. La Viña and A. de Leon, “Two Global Challenges, One Solution: International Cooperation to Combat Climate Change and Tropical Deforestation,” CGD Working Paper, Center for Global Development, Washington DC, forthcoming.
. M. Dharmasaputra and A. Wahyudi, “The Impact of Payment-for-Performance Finance on Political Economy of Deforestation in Indonesia.” background paper, Center for Global Development, Washington DC, forthcoming.
. K.A. Elliott, “Biofuel Policies”; M. Wolosin and D. Lee, “US Support for REDD+: Reflections on the Past and Future Outlook,” CGD Policy Paper, Center for Global Development, Washington DC, forthcoming.
. M. Norman and S. Nakhooda, “The State of REDD+ Finance,” CGD Working Paper 378, Center for Global Development, Washington DC, 2014. Forests exert a profound influence on the atmosphere. Terrestrial vegetation, dominated by tropical forests, breathes in 123 billion tons of carbon every year through photosynthesis, and breathes out nearly as much through respiration. This is 15 times more than all annual emissions from burning fossil fuels. 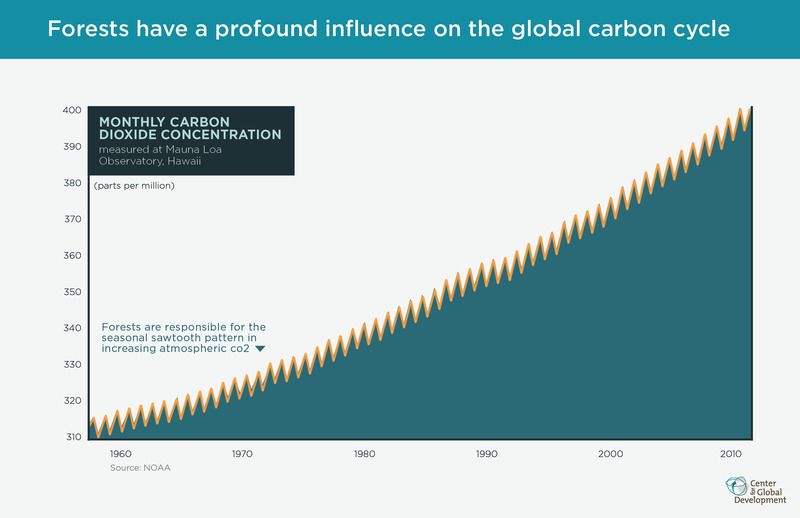 The world’s forests cycle so much carbon that their seasonal growth and dormancy is responsible for the sawtooth pattern seen in charts showing rising carbon dioxide concentrations in the atmosphere, as illustrated in figure 1. When forests are converted to agriculture, pasture, mining, or urban areas, the atmosphere suffers threefold (figure 2). First, the atmosphere suffers because a steady net flow of carbon from the atmosphere to forests is lost. Left undisturbed, natural forests are a carbon sink, meaning that growing trees in the forest trap more carbon through photosynthesis than dying trees release. 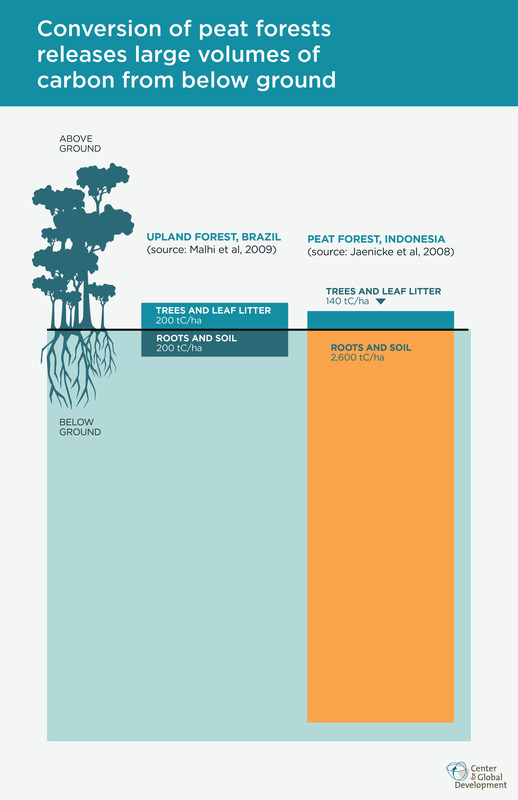 Forests continuously stock carbon away in ever-increasing biomass and in the soil. Big old trees actually remove carbon from the atmosphere faster than younger trees; a discovery that overturned longstanding conventional wisdom. Of the 10.4 billion tons of carbon dioxide taken out of the atmosphere every year by forests, 4.4 billion tons is taken up by mature forests. Next, the atmosphere suffers from deforestation because the massive stock of terrestrial carbon that has accumulated over many years in the trees and soil is rapidly released to the atmosphere. The world’s tropical forests store 471 billion tons of carbon—more than all the carbon ever emitted from burning fossil fuels. And every year 5 to 11 billion of these tons are released to the atmosphere from deforestation. If tropical deforestation were a country, its emissions would be ahead of the European Union and behind China. Finally, the new land use is usually an ongoing emitter of carbon flows to the atmosphere. Agriculture, the largest driver of tropical deforestation, releases 5.4 billion tons of carbon dioxide globally every year. All in all, deforestation harms the atmosphere by releasing a carbon stock and reversing a carbon flow. Developed northern-latitude countries have been clearing their forests for centuries. As a result, about one-third of all human-caused greenhouse gas emissions since 1750 have been from land-use change—mostly deforestation in Europe, North America, and temperate Asia (figure 3). In recent times deforestation in the northern latitudes has given way to rotational forestry, which is far more benign from a climate standpoint than permanently converting forest land to other uses. However, deforestation has now shifted to the tropics. Every year 92 thousand square kilometers of tropical forests are lost—an area the size of Maine or Portugal—while only 21 thousand square kilometers are allowed to grow back. The pace of tropical deforestation is actually accelerating by 2,100 square kilometers each year. Burning a sq. mile of tropical forest releases as much CO2 as driving an American car to the sun and back, twice. Because tropical forests are so rich in carbon, the climate impact of deforestation in these latitudes is even greater. A typical hectare of tropical forest stores 164 tons of carbon aboveground, while typical hectares of temperate forest and boreal forest store just 61 and 47 tons of carbon, respectively. Burning a single square mile of tropical forest releases as much carbon dioxide to the atmosphere as driving the average American passenger vehicle for 369 million miles—the distance to the sun and back, twice. And this is even before counting the carbon that is stored below ground. If tropical deforestation were a country, its emissions would be ahead of the European Union and behind China. Deforestation contributes especially strongly to global warming when it occurs in the tropics for another reason too, related to the reflection of sunlight. Dark surfaces absorb more heat than light surfaces, as anyone who has worn a black outfit during summertime understands. The thick white clouds that are generated by tropical rainforests reflect the sun’s warming rays back to space, while darker cleared ground absorbs this warmth. Meanwhile, regrowing tropical forests sequesters 6.0 billion tons of carbon dioxide per year (about as much as is emitted annually by the United States), and mature tropical forests sequester 4.4 billion tons of carbon dioxide per year (about as much as is emitted annually by the European Union). Together with the oceans, which absorb 8.4 billion tons of carbon dioxide each year, forests form a “subsidy from nature” that buffers against climate change being even worse. Since the start of the industrial revolution, oceans and the land, dominated by forests, have removed 315 GtC that would otherwise have remained in the atmosphere (figure 3). Because of these natural sinks, the atmospheric greenhouse gas concentration is increasing by only 2 parts per million each year rather than 4 parts per million. How much would stopping tropical deforestation contribute to climate change mitigation? The IPCC estimates that net emissions from forest loss contribute about 11 percent of global emissions, but this figure underestimates forests’ potential contribution to climate mitigation. 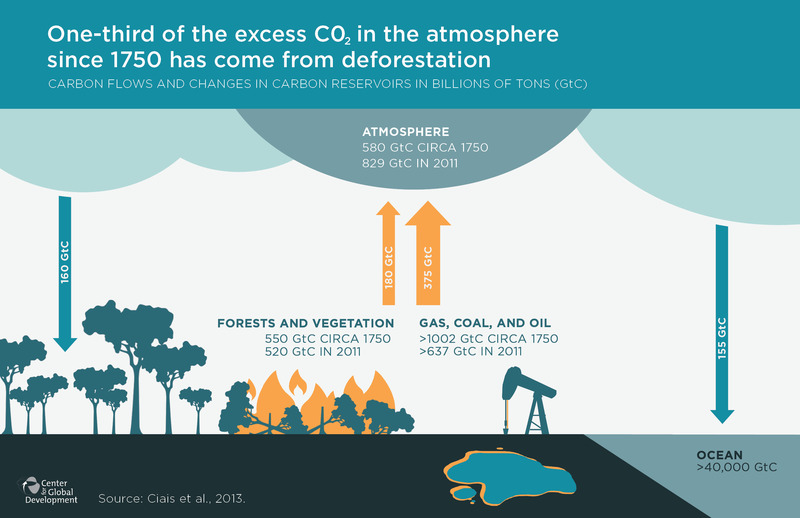 Gross emissions from tropical deforestation are up to 20 percent of total annual emissions, while carbon sequestration by forest regrowth removes up to 11 percent of total annual emissions (figure 5). Because deforestation and forest regrowth largely occur in different parts of the world, halting deforestation and accelerating forest restoration are not mutually exclusive and can be undertaken simultaneously. Thus the total contribution to climate mitigation of stopping deforestation and continuing reforestation could be as high as 31 percent. When the sequestration provided by mature forests is factored in as well, the contribution of forests is even larger. Carbon sequestration by tropical primary forests removes 8 percent of total annual emissions. If all deforestation were halted tomorrow, and if damaged forests were allowed to regrow and mature forests were left undisturbed, then the change in carbon flows from tropical forests would offset up to 38 percent of total annual greenhouse gas emissions, or up to 48 percent of all greenhouse gas emissions from non-forest sectors. Actions to slow, halt, and reverse deforestation are thus a priority for mitigating climate change. Brazil’s deforestation has fallen rapidly in the last decade but remains high. Indonesia’s deforestation has grown to overtake Brazil’s. Other hotspots of tropical deforestation are found across the Andes and Amazon, Central America, West Africa, and Southeast Asia. 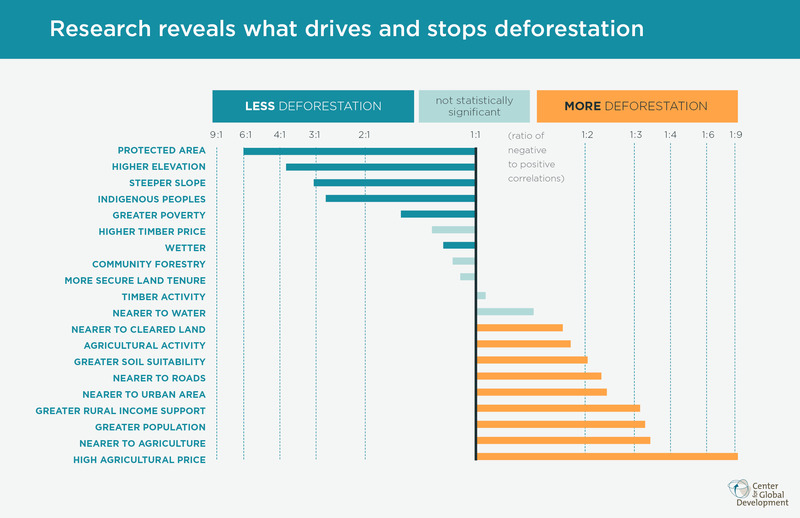 Deforestation is currently low throughout the Congo Basin and Guyana Shield, but in the absence of countervailing policy, deforestation in these regions can be expected to increase to meet growing demand for food, fuel, and fiber. Forest restoration, as is taking place in East Asia and South Asia, can and should be accelerated. But the global mitigation response can’t be limited to just planting more trees. Restoring damaged forests and reducing degradation are important for climate mitigation, but are secondary priorities after stopping the loss of intact forests. 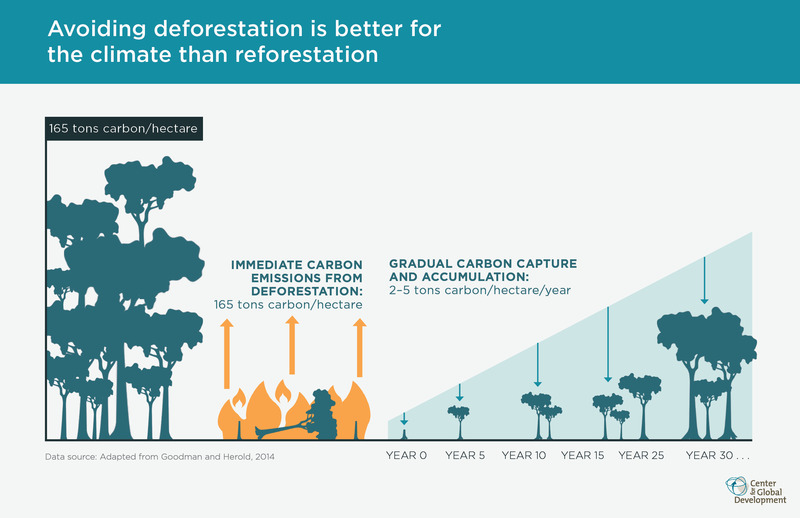 Once deforestation has released the carbon stock of a mature tropical forest, it takes decades for a replanted or regenerating forest to sequester the equivalent amount of carbon back from the atmosphere (figure 6). The diversity of animal and plant life once provided by the original forest may not be regained for centuries. In sum, continued clearing of tropical forests both releases a major stock of heat-trapping carbon into the atmosphere and reverses an existing planetary-scale flow of carbon from the atmosphere into growing forests. Carbon stocks liquidated into the atmosphere from deforestation will require decades to rebuild, meaning that planting trees alone is not enough. The course of action is clear: stop tropical deforestation and allow damaged forests to regrow, thereby capturing almost half of human-caused emissions from other sources.
. P. Ciais et al., 2013, “Carbon and Other Biogeochemical Cycles,” in Climate Change 2013: The Physical Science Basis, contribution of Working Group I to the Fifth Assessment Report of the Intergovernmental Panel on Climate Change.
. Stephenson et al., 2014, “Rate of Tree Carbon Accumulation Increases Continuously With Tree Size,” Nature 507:90–93.
. R. C. Goodman and M. Herold, “Why Maintaining Tropical Forests Is Essential and Urgent for a Stable Climate,” CGD Working Paper, Center for Global Development, Washington DC, forthcoming.
. Y.D. Pan et al., 2011, “A Large and Persistent Carbon Sink in the World’s Forests,” Science 333(6045): 988–993; G.R. van der Werf et al., 2009, “Estimates of Fire Emissions From an Active Deforestation Region in the Southern Amazon Based on Satellite Data and Biogeochemical Modelling,” Biogeosciences 6(2):235–249.
. Authors’ calculations based on national GHG emissions in 2011, including land-use change and forestry, Climate Analysis Indicators Tool 2.0 © 2014, World Resources Institute, Washington, DC: http://cait2.wri.org.
. O. Edenhofer et al., “Summary for Policy Makers,” in Climate Change 2014: Mitigation of Climate Change, contribution of Working Group III to the Fifth Assessment Report of the Intergovernmental Panel on Climate Change.
. M.C. Hansen, et al., 2013, “High-Resolution Global Maps of 21st-Century Forest Cover Change,” Science 342:850-853.
. Authors’ calculation, based on U.S. Environmental Protection Agency Clean Energy Calculations and References: http://www.epa.gov/cleanenergy/energy-resources/refs.html.
. K. Hergoualc’h, and L.V. Verchot, 2014, “Greenhouse Gas Emission Factors For Land Use and Land-Use Change in Southeast Asian Peatlands,” Mitigation and Adaptation Strategies for Global Change 18:789–807.
. G.R. van der Werf et al., 2009, “CO2 Emissions from Forest Loss,” Nature Geoscience 2:737–738; J. Grace et al., 2014, “Perturbations in the carbon budget of the tropics,” Global Change Biology 20(10): 3238–3255.
. O. Phillips and S.L. Lewis, 2014, “Recent changes in tropical forest biomass and dynamics,” in Forests and Global Change, edited by D.A. Coomes, D.F.R P. Burslem and W.D. Simonson, 77–108 (Cambridge University Press, Cambridge and New York: British Ecological Society).
. C. Le Quéré, 2014, “Global Carbon Budget 2014,” Earth System Science Data Discussion 7: 521–610; C. Goodall, Ten Technologies to Fix Energy and Climate (London: Profile Books, 2008). More electricity. Fewer cases of diarrhea. Fewer lives lost to deadly storms. All of these development objectives are supported by tropical forests. Protecting tropical forests is therefore not only a cost-effective option for mitigating global climate change—itself a fundamental threat to development—it also contributes a flow of goods and services that contribute directly to development and rural livelihoods. Figure 1 summarizes these contributions. Tropical forests once covered 12 percent of Earth’s land area; now they cover less than 5 percent. Yet no other terrestrial biome exerts a more profound influence on weather patterns, fresh water, and biodiversity, which in turn contribute to food and energy security and human health and safety. Tropical deforestation undermines the provision of these goods and services in the countries where the forests are located and in distant countries that depend on flows from far away. For decades the default development path for forest-rich tropical nations has been to intensively log forests and then convert the land to pasture, agriculture, or mining. But the potential economic benefits of exploiting forests in this way have seldom been weighed against the loss of goods and services provided by standing forests. The contribution of intact forests to rural livelihoods and broader human well-being is largely uncaptured in national statistics, and is thus invisible to development planners. Yet forests provide immense value to developing economies. And because the households that benefit most from forests’ services are poor, remote, and vulnerable, forest loss can be regressive. 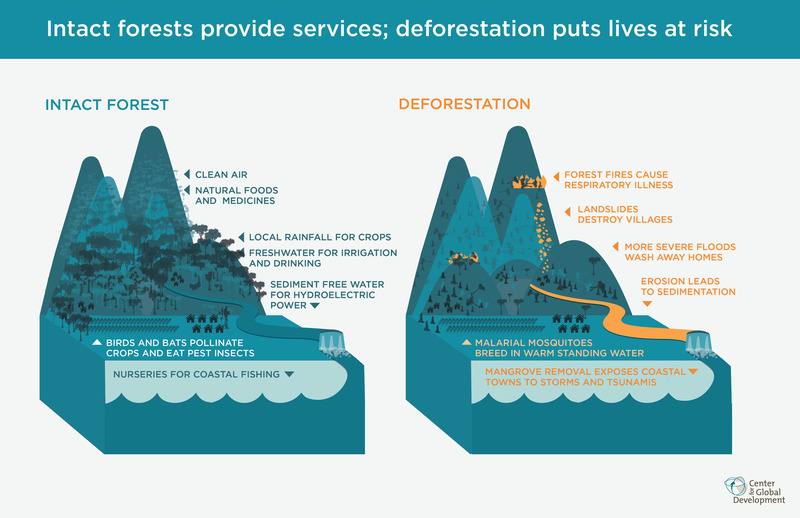 The figure below illustrates the services provided by intact forests and the damages caused by deforestation. Figure 2 illustrates the services provided by intact forests, and the damages caused by deforestation. Food security is a top priority on development agendas, but the role that forests play in providing food—both directly via subsistence and cash to buy food and indirectly through ecosystem services that benefit agriculture—is often overlooked. Contrary to conventional wisdom, clearing forests for food crops can actually undermine food security by destroying the ecological infrastructure that supports agricultural systems and fisheries, as described below. Favorable weather is what differentiates a fertile agricultural breadbasket from an arid inhospitable wasteland. Forests contribute to local, regional, and intercontinental weather patterns through the moisture and energy that they cycle and return to the atmosphere. At the local scale, tropical forests’ evapotranspiration increases the moisture levels of downwind ecosystems. At the regional scale, atmospheric modeling suggests that large-scale deforestation of the Amazon would cause the region to become hotter, drier, and less cloudy. Even low levels of Amazon deforestation could lead to a rapid drop in regional rainfall, to the point that “at least 90 percent of Amazonia and 40 percent of Cerrado should be sustained to avoid subregional bioclimatic savannization.” Less forest also makes dry seasons last longer, while reforestation can begin to reverse these effects. Across continents, deforestation in one area can lead to unexpected and distant problems in rainfall, temperature, and storm tracks. For example, rainfall to the US Midwest could decline by up to 35 percent if Central African forests are cleared, raising food prices as a result. Health: The 1997–98 forest fires in Indonesia caused more than 15,000 deaths and $300 million in health damages from respiratory illness in Southeast Asia. Safety: When a cyclone struck Orissa (now Odisha), India, killing more than 10,000 people in 1999, the presence of mangrove forests reduced damage costs by 80 percent and every 68 hectares of mangrove forest saved one human life. Energy: Banning logging and restoring forest on 440,000 hectares in the watershed upstream from China’s Three Gorges Dam increased electricity production by $22 million/year and saved $15 million/year in avoided costs of clearing sediment. Food: Every hectare of mangrove forest removed in Thailand reduced the present value of fishery production by $708–978. Water and Sanitation: Protecting forests around a village in Flores, Indonesia, increased dry-season water flow by 1 percent, making more water available for cleaning and cooking, thereby reducing diarrhea by 0.19 cases per household per year. Generally the economic value of tropical forests will be greatest in densely populated regions where households are dependent on agriculture or fishing and where incomes are low or the risks of natural disasters are high (or both).
. S. Jayachandran, “Air Quality and Early-Life Mortality Evidence from Indonesia’s Wildfires,” J. Human Resources 44: (4) 916–954; D. Glover and T. Jessup, Indonesia’s Fires and Haze: The Cost of Catastrophe (Singapore and Ottawa, Canada: Institute of Southeast Asian Studies and International Development Research Centre, 1999).
. R. Badola and S.A. Hussain, “Valuing Ecosystem Functions: An Empirical Study on the Storm Protection Function of Bhitarkanika Mangrove Ecosystem, India,” Environmental Conservation (2005 issue 1): 85–92; S. Das and J. R. Vincent, “Mangroves Protected Villages and Reduced Death Toll during Indian Super Cyclone,” Proceedings of the National Academy of Sciences 106(18): 7357–7360.
. Z. Guo et al., “Hydroelectricity Production and Forest Conservation in Watersheds,” Ecological Applications 17: 1557–1562, 2007.
. E.B. Barbier, “Valuing Ecosystem Services as Productive Inputs,” Economic Policy, 22: 177–229, 2007.
. S.K. Pattanayak and K.J. Wendland, “Nature’s Care: Diarrhea, Watershed Protection, and Biodiversity Conservation in Flores, Indonesia.” Biodiversity and Conservation 16(10): 2801–2819. Water quality and availability are regulated by forests, which filter surface water and reduce runoff, thus ensuring that irrigation systems are supplied with water and protected from siltation. Free pollination and pest control services are provided to nearby croplands by the winged inhabitants of tropical forests—bees, bats, and birds. A recent study of Indonesian cacao agroforestry found that crop yields in areas distant from forest were 31 percent lower than places nearer to primary forests where birds and bats provided biocontrol services. Forests also provide forage and cool shade for livestock. Freshwater and coastal fisheries are also dependent on forests. Forests near rivers reduce sediments, are a source of organic fish food, and reduce river temperatures, all of which are important for maintaining healthy river fisheries. Sediment concentrations in streams running through oil palm plantations were between 4 and 550 times higher than in mature forest. The proportion of fish that rely on mangroves at some stage of their life cycle is estimated to be 30 percent of fish catch in Southeast Asia, 60 percent of commercial fish species in India, and 67 percent of commercial fish catch in eastern Australia. Forest-based foods and income to buy food contribute directly to the food security of poor households. Wild products from natural forests constitute a significant share of rural livelihoods. A study of some 8,000 households in and around forests in the tropics revealed that on average, forest products such as timber, fuelwood, and bushmeat contributed 21 percent of annual household income, ranging as high as 63 percent at a site in Bolivia where people harvested Brazil nuts. This contribution—on par with income from agricultural activities—is mostly in the informal economy. It is thus seldom captured in national statistical accounts and is invisible to economic planners. Hydropower generation depends on clean, abundant, and reliable water. Forested watersheds supply water to reservoirs behind hydroelectric dams and protect against erosion and sedimentation that shortens the useful life of such infrastructure. At the Calima Dam in Colombia, restoring cloud forest cover in the watershed from 55 percent to 90 percent would increase water flow by an estimated 12 percent, power generation by 4.2 percent and revenue by 5.4 percent. Forested watersheds supply sediment-free water to power hydroelectric dams. Indeed, healthy forests are the most effective land cover in reducing sediment in water, and upland forests and cloud forests are particularly effective. A recent study calculated that cloud forests, though covering only a relatively small area (4.4 percent) of relevant watersheds, supply 21 percent of the surface water to the reservoirs above dams in the tropics. For communities without access to modern energy sources, forests provide fuelwood and charcoal. Forests contribute to human health in number of ways, including providing access to food, as described above. A third of the forest-based income earned by communities in and around forests is in the form of foods such as wild fruits and bushmeat, which are often important for nutrition. Forests remove pollution from water flowing overland and filtering into groundwater. Vegetation, leaf litter, microbes, and soils all remove or biochemically transform contaminants. Dirty water causes millions of children to die from waterborne diseases such as diarrhea every year. One study in Indonesia estimated the water cleaning function of a local forest averted 2,600 cases of diarrhea over the course of a year for population of 13,700 households. Forest plants and animals with medicinal properties are critical to the well-being of the majority of people in developing countries who rely largely on traditional medicines in the event of illness or injury. Tropical forests are home to two-thirds of all terrestrial plants and animals, and this extraordinary biodiversity makes tropical forests important locally as well as globally as a potential source of genetic material for new pharmaceuticals. One-quarter of all modern medicine is derived either directly or indirectly from medicinal plants or from synthesizing new compounds based on traditional uses of plants, many of which originated from forests. Scientists have identified thousands of tropical forest plants as having potential anti-cancer properties, dozens of which have been shown to be active against cancer cells in clinical screens. Drugs derived from tropical forest plants, such as vinblastine, lapachol, and camptosar, are routinely used in therapy to treat many types of cancer. Disease vectors react differently in forested and deforested areas. Intact forests contain a higher number of insectivores that eat mosquitoes, and their cooler temperatures slow the rate at which mosquitos mature, in comparison to disturbed areas. Deforestation can enhance the conditions for malaria, with small pools of standing water and warmer temperatures leading to faster larval growth. Deforestation has also been linked to Ebola, Rift Valley fever (RVF) virus, dengue fever virus, and West Nile fever virus, schistosomiasis, hantaviruses, simian immunodeficiency virus (SIV), leishmaniasis, and other diseases. Human consumption and trade of forest animals has been linked to emerging infection diseases that come from wildlife, known as zoonotic diseases. Smoke from forest fires has a significant adverse impact on human health. Deforestation is commonly achieved through intentional burning, and degraded forests are more vulnerable to wildfires. Thus, a significant benefit of maintaining intact forests is the avoided damage to respiratory health caused by smoke and haze. Forest burning is responsible for high emissions of heavy metals and particulates that threaten human health near and far as particulates, heavy metals, and carcinogens can travel across oceans. Five to ten percent of premature deaths from air pollution have been attributed to the burning of biomass. One study estimated that the forest fires in Indonesia in 1997–8 led to more than 15,000 infant, child, and fetal deaths, with poorer areas hit hardest. While the haze traveling across Singapore made international news, the communities that suffered the most were those in Indonesia nearest to the fires. Forests also provide benefits to human health by removing pollutants from the air. Natural disasters take a tremendous toll on life and property throughout the developing world. Tropical forests can’t stop tsunamis, cyclones, landslides, and floods from happening, but they can mitigate their effects. Mangrove forests absorb wave energy, providing protection to coastal communities against storms and tsunamis. The 2004 Boxing Day tsunami in the Indian Ocean spawned a generation of studies demonstrating the extent to which mangrove forests attenuated the impact of waves on coastal communities, saving lives and property. Mangrove forests can also dampen the destructive force of cyclones by slowing waves and floodwaters with their complex root structures and reducing maximum wind speeds. Forests can reduce small to moderate floods better than other land cover because of their greater evapotranspiration, more absorbent ground, and less soil erosion. However, the impact of forests in mitigating larger floods remains debated. Forests can reduce both small and large landslides, while deforestation can lead to surface erosion and shallow, rapid landslides triggered by heavy rainfall. Upland deforestation is particularly concerning in tropical countries at the nexus of poverty, deforested and eroded slopes, and high water runoff, such as Haiti, Honduras, and the Philippines. One of the reasons that Hurricane Mitch was so devastating in Honduras in 1998 was that deforested hillsides provided no buffer to the heavy rains brought by the storm. Without trees to slow down the water, the run-off was more destructive to downstream infrastructure than it otherwise would have been. 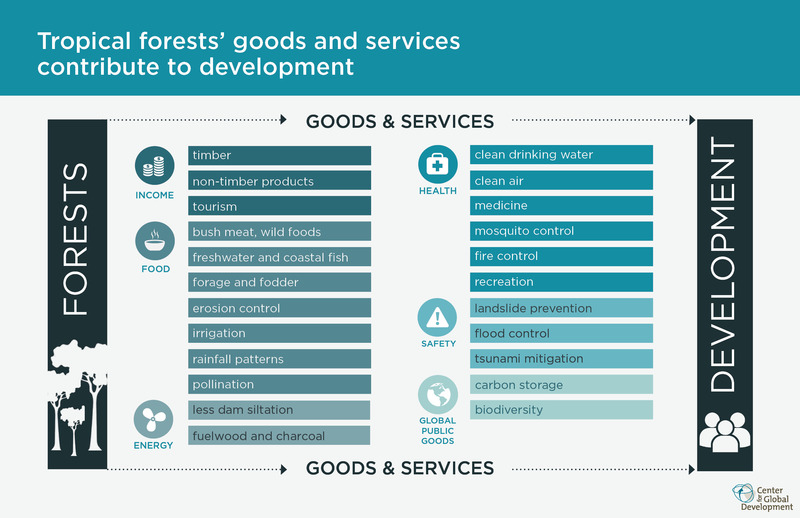 Many of the goods and services provided by forests are important for climate adaptation. They enhance resilience to the extreme weather events that are expected to increase in frequency and severity with climate instability. Poor households have the greatest reliance on forest goods and services as a share of income and the fewest assets to cushion shocks. The loss of forests is likely to be regressive, having a disproportionately negative impact on those already worse off.
. K. Mullan, “The Value of Forest Ecosystem Services to Developing Economies,” CGD Working Paper 379, Center for Global Development, Washington DC, 2014.
. J. Shukla et al., “Amazon Deforestation and Climate Change,” Science, 247(4948): 1322–25.
. J. Foley et al., “Solutions for a Cultivated Planet,” Nature, 478(7369): 337–42.
. G.F. Pires and M.H Costa, “Deforestation Causes Different Subregional Effects on the Amazon Bioclimatic Equilibrium,” Geophysical Research Letters 40(14): 3618–3623.
. D.V. Spracklen, “Observations of Increased Tropical Rainfall Preceeded by Air Passage over Forests,” Nature 489: 282–5.
. D. Werth and R.Avissar, “The Local and Global Effects of African Deforestation,” Geophysical Research Letters 32(12).
. B. Maas, Y. Clough, T. Tscharntke, “Bats and Birds Increase Crop Yield In Tropical Agroforestry Landscapes,” Ecology Letters 16: 1480–1487.
. K. M. Carlson et al., “Influence of Watershed-Climate Interactions on Stream Temperature, Sediment Yield, and Metabolism along a Land Use Intensity Gradient in Indonesian Borneo,” Journal of Geophysical Research: Biogeosciences 119: 1110–28.
. P. Rönnbäck, “The Ecological Basis for Economic Value of Seafood Production Supported by Mangrove Ecosystems,” Ecological Economics 29: 235–252.
. A. Angelsen et al., “Environmental Income and Rural Livelihoods: A Global-Comparative Analysis,” World Development (in press).
. L. Sáenz et al., “The Role of Cloud Forest Restoration on Energy Security,” Ecosystem Services 9: 180–90.
. L. S. Hamilton and Food and Agriculture Organization of the United Nations, Forests and Water: A Thematic Study Prepared in the Framework of the Global Forest Resources Assessment 2005 (Rome: Food and Agriculture Organization of the United Nations, 2008).
. M. Mulligan and L. Sáenz, “The Role of Cloud Affected Forests (CAFs) on Water Inputs to Dams,” Ecosystem Services 5: 69–77.
. M. Acreman et al., “Report of the Work of the Expert Group on Maintaining the Ability of Biodiversity to Continue to Support the Water Cycle, ” report prepared for the eleventh meeting of conference of the parties to the Convention on Biological Diversity, Hyderabad, India, October 8–19, 2012; K. A. Brauman et al., “The Nature and Value of Ecosystem Services: An Overview Highlighting Hydrologic Services,” Annual Review of Environment and Resources 32(1): 67–98; Jefferson S. Hall et al., “The Ecology and Ecosystem Services of Native Trees: Implications for Reforestation and Land Restoration in Mesoamerica,” Forest Ecology and Management 261(10): 1553–7.
. A. C. Hamilton, “Medicinal Plants, Conservation, and Livelihoods,” Biodiversity and Conservation 13(8): 1477–1517.
. M.M. Robinson and X. Zhang, Traditional Medicines: Global Situation, Issues, and Challenges, The World Medicines Situation Edition 3 (Geneva: WHO; 2011).
. T. Reynolds, “Tropical Rain Forest Conservation Tied to Drug Development,” Journal of National Cancer Institute, 83: 594–6.
. A.Y. Vittor et al., “Linking Deforestation to Malaria in the Amazon: Characterization of the Breeding Habitat of the Principal Malaria Vector, Anopheles Darlingi,” The American Journal of Tropical Medicine and Hygiene 81(1): 5–12.
. R. C. Sang and L. M. Dunster, “The Growing Threat of Arbovirus Transmission and Outbreaks in Kenya: a Review,” East African Medical Journal 78(12:) 655–61.
. S. S. Myers et al., “Human Health Impacts of Ecosystem Alteration,” Proceedings of the National Academy of Sciences 110(47): 18753–18760; G. Zorello Laporta et al., “Biodiversity Can Help Prevent Malaria Outbreaks in Tropical Forests,” PLoS Negl Trop Dis 7(3): e2139; B. A. Wilcox and B. Ellis, “Forests and Emerging Infectious Diseases of Humans,” UNASYLVA-FAO 57(2): 11; K. Campbell et al., “Strengthening International Cooperation for Health and Biodiversity,” EcoHealth 8(4): 407–409.
. S. Jayachandran,“Air Quality and Early-Life Mortality Evidence from Indonesia’s Wildfires.” Journal of Human Resources 44(4): 916–54.
. E.W. Koch et al., “Non-Linearity in Ecosystem Services: Temporal and Spatial Variability in Coastal Protection,” Frontiers in Ecology and the Environment 7(1): 29–37; E. B. Barbier et al., “The Value of Estuarine and Coastal Ecosystem Services,” Ecological Monographs 81(2): 169–193.
. B. Locatelli, “Local, Global: Integrating Mitigation and Adaptation,” Perspective (Center for International Forestry Research, Paris, 2010. 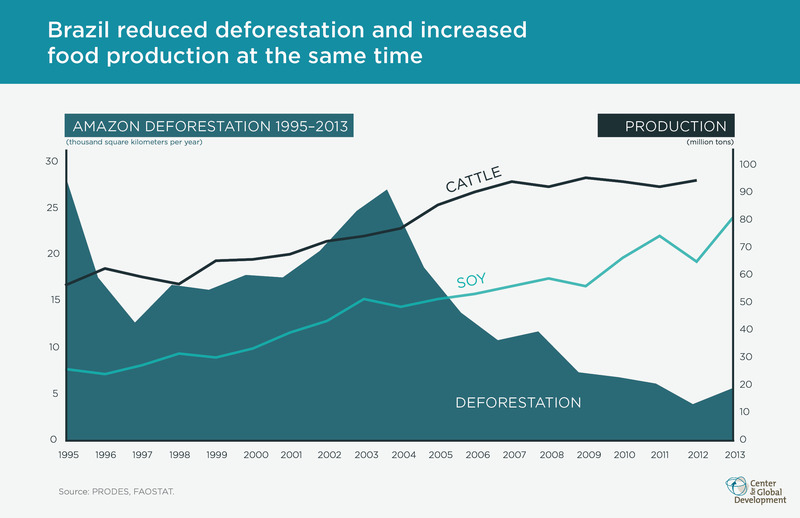 From 2004 to 2013, Brazil cut Amazon deforestation by 80% while increasing soy and cattle production. But over the last decade, Brazil’s success in bringing its deforestation frontier under control has been astonishing. Brazil dramatically decreased deforestation, cutting the rate of deforestation in the Amazon by nearly 80 percent from a high of 27,800 square kilometers in 2004 to 5,800 square kilometers in 2013 (even after a 28 percent jump from a low of 4,600 square kilometers in 2012). Importantly, Brazil did so while simultaneously increasing agricultural production. Over the same 2004–2013 period, soy and cattle production increased by 65 percent and 21 percent, respectively (figure 1). Thanks to its success in reducing deforestation, Brazil is now lauded internationally as the country that has made the world’s largest contribution to mitigating climate change. From 2003 to 2008, Brazil expanded the area of Amazon forest within protected areas or recognized Indigenous Lands by 640 thousand square kilometers—an area the size of France. By 2010, protected areas and identified Indigenous Lands covered 2.2 million square kilometers (44 percent of the region)—an area larger than Greenland. In 2004, the Brazilian Ministry of the Environment began undertaking high-profile law enforcement actions to send a signal that illegal forest conversion would no longer be tolerated, as part of the Action Plan for the Prevention and Control of Deforestation in the Legal Amazon (PPCDAm). Many of these law enforcement actions were carried out along roads. In 2005, the Brazilian Space Agency (INPE) began near-real-time monitoring of forest loss using satellite imagery and disclosing the results to the public. Civil society groups were able to use this same information to analyze drivers of deforestation and raise public awareness of the problem. In 2006, soy traders voluntarily imposed a moratorium on sourcing soybeans from recently deforested areas. The moratorium has been extended every year thereafter. In 2008, the Brazilian National Monetary Council began to withhold access to credit from municipalities with high deforestation rates. In 2008, the Amazon Fund was established, managed by the Brazilian National Development Bank (BNDES). The Amazon Fund finances projects that contribute to reducing deforestation and promoting sustainable development in the Amazon, offering a carrot to augment the sticks described above. In 2012, the revised Forest Code allowed rural settlers to legally register land and access credit without having to clear forest and graze cattle to demonstrate ownership. The Brazilian Agricultural Research Corporation (Embrapa) has invested heavily over decades in increasing productivity of agriculture and pasture on cleared lands and on the Cerrado savanna. All of these actions were backed by strong, high-level, sustained political will. The domestic agenda for reform was reinforced by pressure from civil society activists and from international buyers of agricultural products. Later, the reform agenda was given increased legitimacy and international recognition through a US$1 billion payment-for-performance agreement with Norway. Brazil’s success would not have been possible without two forest monitoring technologies in which the Brazilian Space Agency (INPE) has been a pioneering leader. The first satellite program, called DETER, sends out alerts of where deforestation is happening across the Amazon every two weeks. This technology allows Brazilian authorities to match illegal clearing to specific properties and to enforce forest laws. Economists at the Pontifical Catholic University of Rio de Janeiro figure that deforestation in the Amazon would have been 59 percent higher without the DETER program. The other program, called PRODES, provides accurate numbers for exactly how much deforestation has happened and where, on an annual basis. So as Brazil ramped down its deforestation year after year, it could showcase its success to the rest of the world, and receive performance-based payments from Norway and other contributors into the Amazon Fund. Up until now, these data were available nowhere else in the tropics. But now, PRODES-like and DETER-like data are accessible to every forest country. These data can be used elsewhere to support the political will, civil society activism, and complementary private sector actions that led to Brazil’s success. Brazil cut deforestation with protected areas, Indigenous Lands, law enforcement, roads, agriculture, and incentives. When Amazon deforestation was at its height in the 1980s, the international community “discovered” the problem of tropical deforestation. Since then, forest researchers and practitioners have amassed an enormous amount of knowledge and experience about the causes of deforestation and how to address them. The roles of technological interventions, economic incentives, and governance reforms have been asserted, tested, and refined. With the availability of low-cost, high-resolution spatial data on forest cover change, establishing links between policy actions and deforestation outcomes is more feasible now than ever before. For Why Forests? Why Now? Jonah Busch and Kalifi Ferretti-Gallon conducted an original meta-analysis of 117 studies that used spatial data and econometric techniques to identify key factors that drive or deter deforestation (figure 2). The analysis suggests several promising approaches for decision-makers seeking to curtail deforestation. As it turns out, these are largely the same measures that Brazil enacted to reduce deforestation in the Amazon. Establish protected areas in regions where forests face higher threat. New protected areas in the 2000s slowed the advance of the “Arc of Deforestation” in the Amazon. Support indigenous peoples, the best allies in the effort against deforestation. The effectiveness of the Xingu Indigenous Reserve at stopping deforestation is visible from space. Enforce laws against clearing forests, which are often already on the books. A successful crackdown on illegal trade in mahogany in 2003 was an early confidence-builder for efforts to control deforestation. Insulate forested land from pressures to convert to meet demand for food, fiber, and fuel, e.g. through supply chain interventions. Establishing a model of international payment-for-performance finance that is acceptable to both domestic and international constituencies for sustainable development.
. PRODES, 2014, National Institute for Space Research (INPE), Brazilian Ministry of Science.
. L. Barbosa, 2004, “Save The Rainforest! NGOs and the Grassroots Organisations in the Dialectics of Brazilian Amazonia,” International Social Science Journal 55(178): 583–91.
. Brazil National Space Agency (INPE), “Projeto PRODES monitoramento da floresta Amazônica Brasileira por satélite,” www.obt.inpe.br/prodes/index.php.
. Food and Agriculture Organization of the United Nations, FAOSTAT database, http://faostat.fao.org.
. C. Springer and M. Wolosin, “Who Cut the Most? Brazil’s Forest Protection Has Achieved Twice US Emissions Reductions,” blog posted to Climate Advisers, January 29, 2014, www.climateadvisers.com/who-cut-the-most-brazils-forest-protection-has-achieved-twice-us-emissions-reductions/.
. Environmental Defense Fund (EDF), “Brazil National and State REDD,” November 2009, available at www.edf.org/sites/default/files/10438­_Brazil_national_and_state_REDD_report.pdf.
. A. Verissimo et al., Protected Areas in the Brazilian Amazon: Challenges and Opportunities (Belém, Brazil: Imazon, with Socioenvironmental Institute [São Paulo], 2013).
. J. Assunção et al., DETERring Deforestation in the Brazilian Amazon: Environmental Monitoring and Law Enforcement (Rio de Janeiro, Brazil: Climate Policy Initiative, 2013).
. M. Rowling, 2014, “Soya Moratorium Extended in Effort to Protect Brazil’s Forests,” Thomson Reuters Foundation, http://www.trust.org/item/20140204130310-d10m5/.
. J. Assunção et al., Does Credit Affect Deforestation? Evidence from a Rural Credit Policy in the Brazilian Amazon (Rio de Janeiro, Brazil: Climate Policy Initiative, 2013).
. N. Birdsall, B. Savedoff, and F. Seymour, “The Brazil-Norway Agreement with Performance-Based Payments for Forest Conservation: Successes, Challenges, and Lessons,” CGD Brief, Center for Global Development, Washington DC, 2014.
. “The Miracle of the Cerrado,” The Economist, August 26, 2010, www.economist.com/node/16886442.
. S. Abranches, “The Political Economy of Deforestation in Brazil and Payment-for-Performance Finance,” CGD background paper, Center for Global Development, Washington DC, forthcoming.
. “Global Forest Watch,” World Resources Institute, www.wri.org/our-work/project/global-forest-watch.